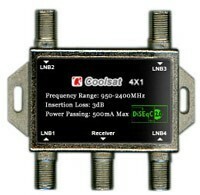 4x1 Coolsat 4 in 1 diseqc 2.0 switch. Don't settle for less. This is a high quality original Coolsat diseqc switch from a trusted name in satellite. Itl is also a regular size, not a mini. For users that are unfamiliar with a diseqc 2.0 switch, it's purpose is to take up to four different satellite inputs and output to one receiver. The good thing about Coolsat diseqc 2.0 switches is that they are compatible with all brands and types of lnbs. So you could use linear lnb's in one input and circular dishnetwork lnb's in another input and an FTA receiver would be able to switch between the two without a problem. This makes it more convenient than switches like the DP34 which will only work with a dishpro brand LNB. The new switch will offer reliability, performance, and a longer life. This switch is also compatible with diseqc 1.0, diseqc 1.1 and diseqc 1.2 standards. Feel confident it will work with your brand receiver. As a side note, you must be sure the receiver is turned off when connecting diseqc switches.